I'm probably not as committed to photographing groups of three as my friend Peter but I do like to capture them when they stray into the compass of my lens. 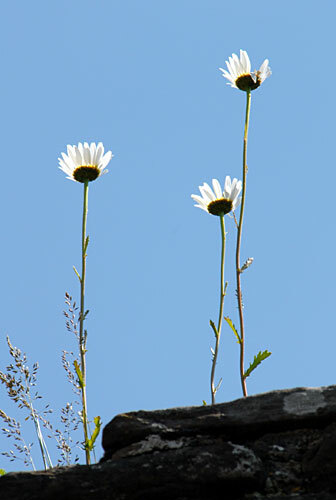 These flowers, which may or may not be daisies, were growing on the top of the battlements of Skenfrith Castle, a derelict fortification in Monmouthshire. I took them with a long lens while lying on the grass on my back; it was a pleasant position to be in and very conducive to a short nap. However a party of school children rendered the aural landscape unsuitable for such an activity (or lack of it). I've got the laptop outside on the decking this evening. It's half past nine but still light and cool after a torrid day. The air is scented by roses and honeysuckle. In a while a bat will pay us its daily visit. There is very little sound, just the competing songs of thrush and blackbird, a cooing dove in the far distance and the horn and muted roar of a train from London wending its way up the Vale to Worcester. An empty bottle of New Zealand Sauvignan Blanc sits on the table, a crisp, fruity little number, much enjoyed by us both. Pixie has been polishing up a leather bag she bought today so we briefly had the intoxicating smell of polish added to the mix. I think evenings are all about scent. And reflection. The UK has been pursuing for many years, with no little resistance from its population, a policy of metrication. We have lost the gallon, pint, pound, ounce, foot and yard for buying and selling. The mile hangs on for distance although it’s only a matter of time and, oddly enough, the railways still mark bridges in chains. Nevertheless, despite the insidious influence of Europe, we still maintain two essential non-metric units, one for area and the other for volume. The first is Wales. This moderately sized constituent of the United Kingdom is the standard comparative unit of area measurement for television and radio news (Europeans use Belgium). Anything can be measured in Wales's - the destruction of the rain forest, extent of a bush fire, flooding, retreat of the Arctic ice-fields, in fact anything with an area that's roughly country-sized. It's a very handy unit for the media because no one has the faintest idea how big Wales is. The unit of volume is the domestic cat. This measure tends to be used for animals and usually just in simple terms - bigger than, smaller than; it would be difficult, although not impossible, to quantify an elephant in actual domestic cat units (DCU). Commonly the DCU is used for reports of wild animals seen on the loose in Devon and Cornwall; these sightings often come from persons who've spent an evening on scrumpy or some other mind-altering chemical. Whether these two important and useful measures are swept away by metrication remains to be seen. Perhaps the European Union will build a perfect 100 kilometre square wall somewhere which will be kept at a constant temperature and used as the standard area - I suggest putting it around Brussels would be a good plan as that's where most of the crackpot ideas come from. For volume, the French would probably exert their considerable influence and insist that we replace the humble moggy with something more Gallic. The British will have abandon the cat and adopt the poodle. It will be a sad day. 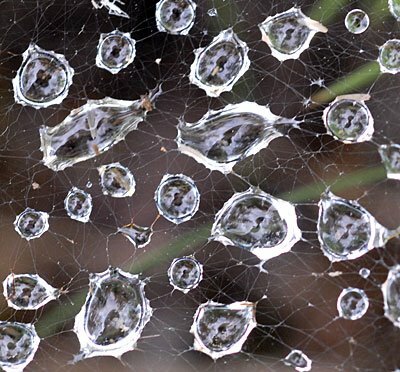 And now, some of nature's jewels. There is a stretch of shingle on the Dorset Coast called Chesil Beach where you can tell what part of the coast you're on by the size of the pebbles under your feet. The sizes are graded, from pea-size in the west, to hen's egg-size at the Portland end. Just carry a compass and a ruler or, for the more nerdy among you, a micrometer. None of this is particularly relevant to today's image as these are Devonian pebbles which, while shaped by the same sea, no doubt twitter, scrunch and rumble with a different accent to that of their Dorset cousins. It's just that I knew that bit about Chesil Beach and I like showing off. The gorgeously red life-belt stands next to a tidal channel that doubtless rewards the foolhardy with a good tug at the legs and a quick trip to the deep. It's a great spot, flanked by low red sandstone cliffs, wind-blown pines and scoured by restless currents. Just right for an afternoon with a good book. You know it's been a poor day for news when this is the best that the local rag can find. 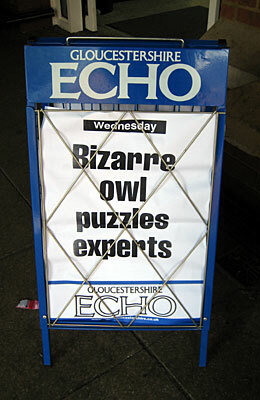 How much are you prepared to spend to get the latest on a bizarre owl? 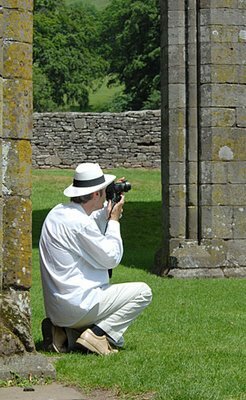 A couple of days ago I was chatting to Mikhail Bralowski, a photographer with nearly fifty years experience as a professional image maker. In the course of our conversation, I discovered that apparently I belong to the National Geographic School of Photography. The reason? It's my obsession with a splash of red. It's years since I was last in a waiting room full of ten-year-old National Geographic magazines so I can't remember if the native dancers depicted therein had red loin clothes (or none at all) or whether the dhows sailed away into the sunset, wafted along under scarlet sails. I'm also not sure if it's a compliment or a curse. Whatever. Here's another image with a splash of muted red. 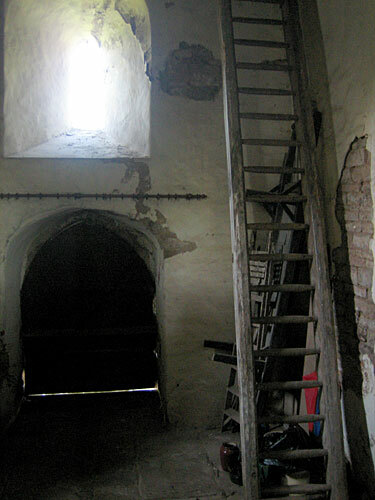 I like the challenge of making something out of the dark, dingy corners of churches, the parts where they keep the byres, watering cans, odd bits of ancient liturgical impedimenta and spare priests. There can be nothing more inviting than the crispy whiteness of a freshly laid table, all set out with eating irons and glassware. I itch to sit down in front of it, expectant, salivating, and yes, apprehensive. For I know that within minutes (seconds if I'm having soup as a first course), I will have soiled this pristine snow with a dollop of something. 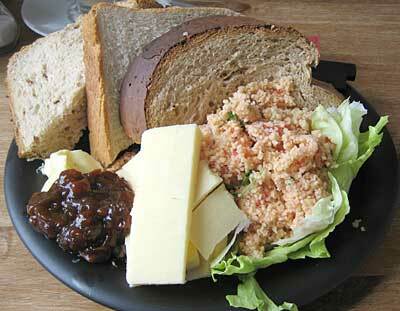 The other night I took the table cloth's virginity with a lump of delicious apple chutney. I quickly scooped it back on to the plate but, as is the way of the world, the juicy chunks had left their mark. To make things worse, they'd fallen in a spot where I couldn't realistically cover the stain with the side plate or a repositioned spoon. For the rest of the meal that stain kept catching my eye, a forlorn reminder of my inadequacy with cutlery. I didn't get where I am today without liking pastries. They have a magnetic attraction, a wilful possessive nature that takes hold of my visual and olefactory senses. As a result, I eat too many. It's not too bad in the UK as, with a few exceptions, what's on offer tends to be a bit uninspiring. I suppose that Eccles Cakes are my favourite, along with anything with apple or marzipan in it (or apple and marzipan, let's not be too fussy). In France, I come seriously unstuck. 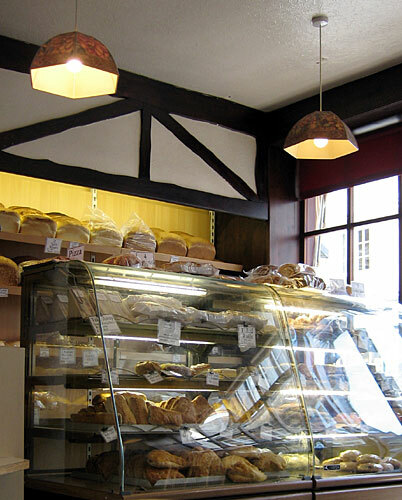 I really need to plan routes around French towns that avoid patisseries altogether. I just cannot pass one without my feet turning through the door. My downfall are millefeuilles, a flaky, layered sandwich of pastry and vanilla flavoured custard, topped with icing. I try and ration myself to no more than one a day. You have to make an effort, don't you? Today the gloom lifted to show the British summer at its most superb - warm, golden sun tempered by a cool, flirtatious breeze. I thought I'd give the thatch theme one more thrashing (and tomorrow I'll try and kill the alliteration bug I'm infected with). This interesting collection of shapes adorns the museum in the Devonian town of Budleigh Salterton, a place well loved by the older members of society - our presence temporarily lowered the average age by about ten years. 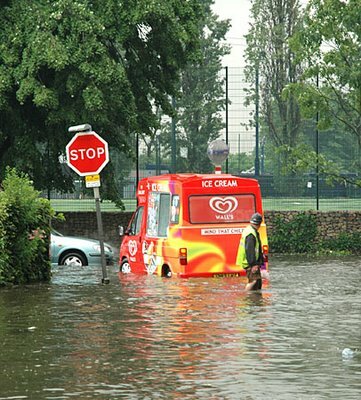 It also has some of the best ice cream in England. I was idly scanning through my recent images when I realised that I have one that pulls together my last two posts. 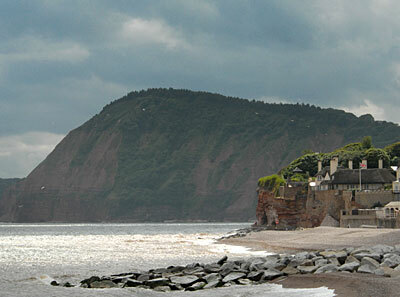 Never one to resist an excuse to fling another picture at the world at large, here is a view of Sidmouth looking west. There are no deckchairs, striped or otherwise although I was stood next to one as I took the photograph. However the colours are there in the Union Jack, fluttering next to the thatched cottage - you may need a magnifying glass to see it. What's more, there's a shaft of sunlight and a pile of gloom. 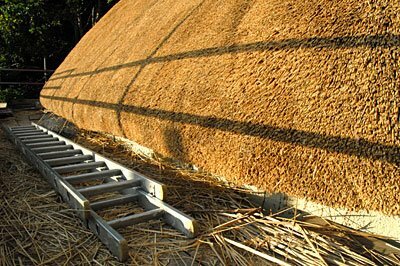 The cottage that my youngest daughter lives in is being rethatched. 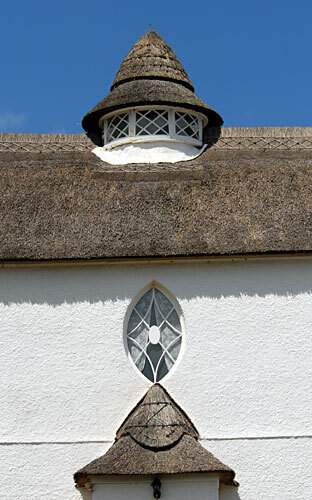 A good thatch should last at least fifteen years and probably up to thirty provided the vunerable parts, like the ridge, are maintained. It's a craft that's still flourishing in Britain with a waiting time of two years to get a good thatcher on the job - not something you can get done at the drop of a hat, or in a trice, two shakes of a lamb's tail, whatever. Traditionally the materials came from reedbeds in Norfolk but these can no longer cope with demand thanks to the predations of modern farming. This roof is covered courtesy of the Ukraine. They're not without their pitfalls - nipping up into the attic with a candle in a blackout is a sure way of meeting your local firemen. Nevertheless they're warm and dry and give a place a great rustic feel. Cast off your slates, your corrugated iron, your cedar shingles and bed down under a heap of grass. You know it makes sense. 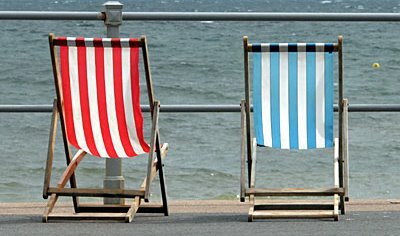 The British summer is conjured up and nailed down by this image of windblown deckchairs on the promenade at Sidmouth in Devon and, beyond, the grey, choppy waters of the English Channel. 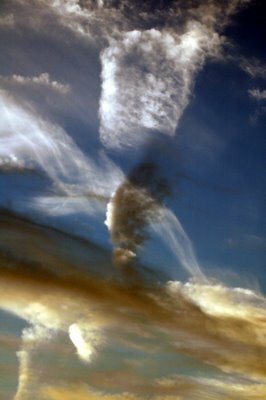 A struggling shaft of shrivelled sunlight, stealing, stuttering from behind a cloud, strives to set the candy stripes upon a path of strength and glory. And then it's gone. Gloom returns. The huddled pensioners seek out the shops, the trinkets, knick-knacks, souvenirs of a day spent hiding from the spitting showers. Or sip and slurp eternal cups of tea, slaking a thirst that suffuses their souls. I'd like to take the credit for the title of today's post but I can't - I've borrowed it from yesterday's Times - the alliteration appealed to me. Have nothing in your houses you do not know to be useful, or believe to be beautiful. This sounds to me a bit like minimalism. British television is awash with programmes purporting to educate the poor benighted population on the wonders of style and decoration. Minimalist designs are often featured and they invariably involve acres of white paint, white fabric, white tiles, white wood, white minds; the result - sterility. Admittedly those of us who believe that global warming is a reality need to grow to love white so that we can become mobile reflectors of the sun's rays but minimalism does not mean colourless (nor does it mean black). There's no harm in a splash of red, or mauve, purple, orange, indigo, cyan, yellow, whatever takes your fancy (steer clear of anything other than mint green unless nausea is your idea of a fun condition). Anyway back to W. Morris, Esquire. I can't pretend to be following his ideas at the moment. I don't think I own any particularly ugly objects but I've plenty of useless ones; blunt scissors, spanners/wrenches that fit nothing I own, keys that work in no known lock, a cravat, television remotes but not the television, floppy discs but no drive, books on how to identify trees. An infinity of defunct objects that are fit only for the skip or the charity shop where someone else can acquire them with the notion that they might prove useful. Many of the things I mentioned may have at one time been useful (except the cravat). However all over the world (but mainly in China), someone is at this very moment manufacturing, using precious earth resources, genuine knick-knacks. These objects are of no known use and questionable beauty, objects whose sole purpose is to remind the owner that they were once in Paris, Majorca, San Francisco, Nempnett Thrubwell - on a shelf somewhere is a gilt plastic Eiffel Tower, a miniature Flamenco dancer, a mug with a picture of the Golden Gate Bridge, a ………; ah, now, I’ve no idea what you might get as a souvenir from Nempnett Thrubwell. A replica cowpat, perhaps? Pixie suggested I photograph some knick-knacks for this blog but, to be honest, I don’t want to give them any more exposure than I have to. Instead, here is an ice cream van in a flood. Peter and I went on a trip to Welsh Wales today (so called to distinguish it from Mammalian Whales). It was a glorious day, warm, sunny and full of the scents of summer. We were on a history trip, visiting ruins, relics from the time when the border between England and Wales was a fluid entity, fought over with ferocity and no place to book a long weekend unless fully kitted out by your local armourer. 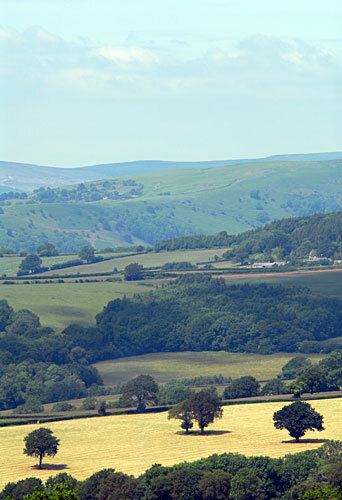 On the journey between Skenfrith Castle and Llanthony Abbey, we crested a hill and came across this gentle view, a distillation of the scenery of the border area. Incidentally I'm claiming this image as a group of three although there are four trees - it's all in the shadows. At Llanthony Abbey, I was pleased to find that a real ale bar that I last visited twenty years ago was still flourishing in the cellar of a hotel built into the ruins. 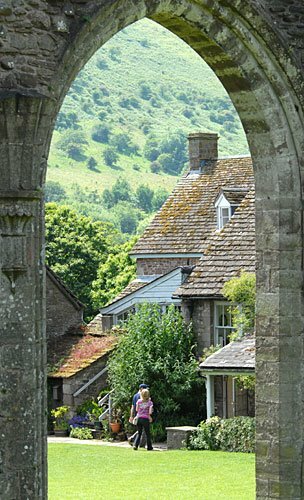 Llanthony was one of the many monastic powerhouses disbanded by Henry VIII in a fit of pique at being ordered about by an Italian cone-head back in the sixteenth century. Peter took the opportunity to model his summer photographer's outfit and very smart it was too. I apologise for not replying to comments at the moment, particularly those from Susan, Josephine, Bluesmama, Hannelie, Lee and Peter. Although I seem to be able to publish posts, I cannot view them. I imagine it's the fault of Microsoft because they're the standard scapegoat but it could be a blogger thing or a computer thing. Is the Heart Growing Fonder? I'm recovering from an attack of work. Normal service will be resumed shortly. 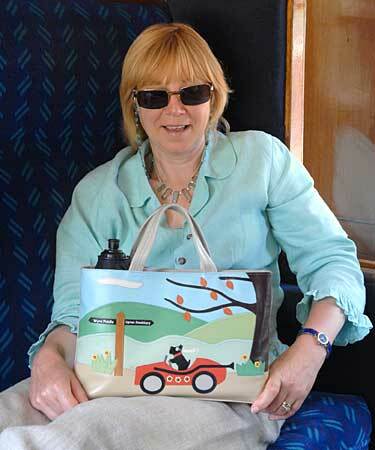 Pixie took her new handbag out for the first time today. Now, as a bloke, obviously I’m not into the whole bag experience but I do appreciate that this one is something special. On the signpost decoration are the names of two of our local villages. I don’t know why an international manufacturer of lady’s requisites should choose to glorify a couple of obscure Worcestershire places but it is possible that the names have something to do with it – they are Upton Snodsbury and Wyre Piddle (NO SNIGGERING AT THE BACK, THERE!). In fact I cycle through Wyre Piddle two or three times a week, crossing over the Piddle Brook in the process. Now what’s funny about that? It’s strange how some place names just cry out to be given a wider audience. Some years ago I lived near Nempnett Thrubwell – it’s such a lovely combination of sounds that it could form a religious mantra. It would certainly be a bit more exiting than chanting Hare Krishna or Om. Anyway the purpose of our journey was to go and have lunch in the Shropshire town of Bridgnorth. 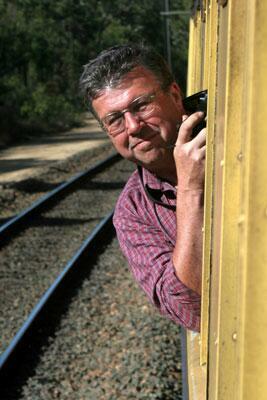 There are several ways to get there and we chose a combination of car and steam train. It was grand. The café, Cinnamon, surpassed even its previous high standards. It’s a vegetarian establishment, heavily into Freetrade and organic food (that’s stuff that's delivered to the premises with the dirt still on it). The Ploughman’s Lunch I had was superb, Pixie’s salad likewise, although I’m not sure what the average British ploughman would have made of couscous - filthy foreign muck would have been the comment, I imagine. Nevertheless I thought it was an excellent variation on an old standard. Coffee was tasty as well. As was the cake. 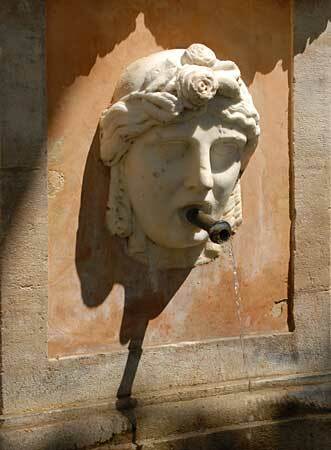 You're never far from a fountain in a Provencal town or village - one of them, Barjols, has 28 but that's just plain greedy; two or three is adequate, preferably in a square sheltered by plane trees. 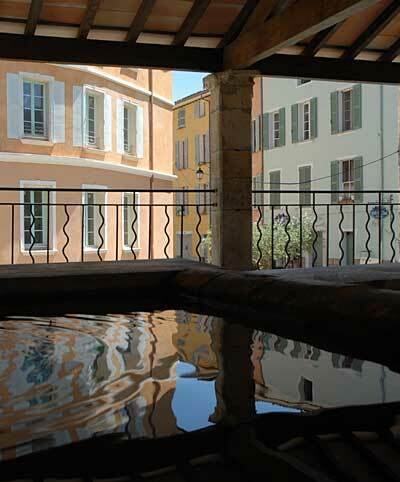 Here you can sit nursing a grand crème or a pastis and listen to the gentle trickling of water, the click of metal on metal as the locals play petanque and the cooing of doves in the branches above, the ground a maze of gently shifting shadows. At least you could if the schools weren't out and every child over the age of about eight seemed t0 be riding a motorised scooter with the noise output of a dozen chainsaws at full throttle in a trashcan. There are times when you could really do with a good stout stick. I write short stories for my own amusement, partly, I suppose, because I enjoy playing with words. It's another of those small life-changing/enhancing tasks I've set myself now I'm in my fifties and can feel the ground growing slimy and beginning to tilt ever more quickly in the direction of downwards. These stories often get their themes from photographs I've taken. The entrance to a derelict chapel, a tree standing in a dewy field, a rusting railway wagon, all have all provided the seed. 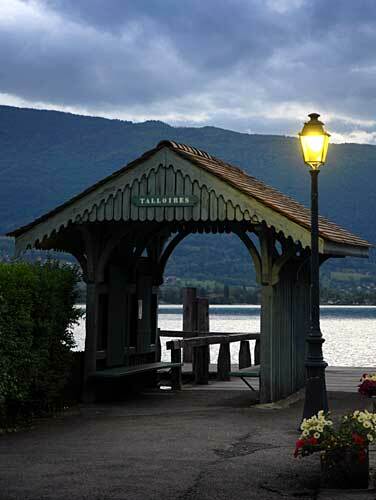 I have a feeling that this image of the shelter on the pier at Talloires in Savoy will do the same. It has many elements that appeal to me - loneliness, waiting, mystery, darkness, water, solitude, light. I'm not sure I could weave an optimistic tale from this picture although that would be a challenge worth rising to. I also think it might provide the germ for a poem. We went for a walk up Bredon Hill this morning, a warm, scented day with little wind, and then spent the afternoon pottering in the garden - oh, but there's nothing to beat a little pottering! 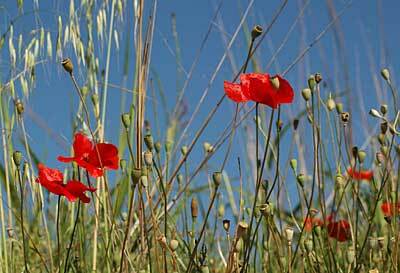 So I thought it appropriate to post a picture I took in France of some poppies. Gorgeous colour, poppies, but just a tiny bit clichéd in the old photographic world. But who cares. I might post another one next week, another bold swagger of ruddy extravagance. It occurs to me that it's some time since I had a serious attack of grumpiness on these pages. 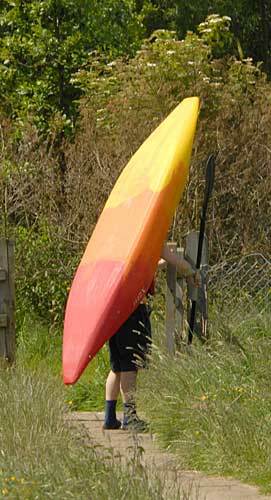 Male summer fashion in the British Isles. I admit that there's no point having any more laws than we already have; the ones we've got are not enforced unless they apply to soft targets (like motorists) or people without the financial clout to fight back. A major issue in the modern world is the lack of respect that some members the society show for those around them. So perhaps we do need to introduce a few new rules. 1. No man with a fat neck may wear a tee-shirt, vest, singlet or other garment which does not have a collar. 2. No man may wear cut-off trousers or shorts - under no circumstances should the British male leg be exposed in public. In Pixie's view women should also be dissuaded from wearing cut-offs as it allows fashion designers to laugh themselves silly at the ridiculous looking garments that they have conned the human race into wearing - don't give them the satisfaction. 3. The fact that the sun has briefly come out is not an excuse to rip off shirts and expose the more respectful members of the population to pale, weedy chests or disgusting flabby torsos covered in tattoos to girls called Sharon or obscure rock bands. It's so easy - show some respect. Pastel colours work well on almost any building but I think it takes the intense, pure light of somewhere like Provence in the south of France to really bring them to life. Seen from within the cool shade of Cotignac's lavoir, these houses vibrate gently in the afternoon sun. I'm not all that keen on seeing myself - it's probably why I've carved out a career behind the camera rather than in front of it. I suppose when you fancy yourself as an amalgam of James Bond, Pink Floyd and a grizzly bear, the true image can be a touch disappointing. 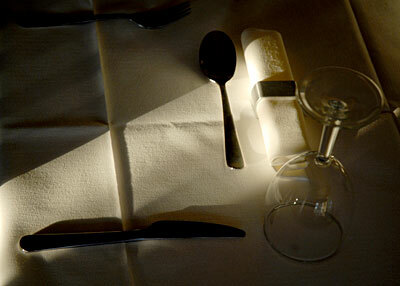 Nevertheless that dead space between the order being taken and the first course arriving needed filling but with what? Small talk might have done it, if I had any. 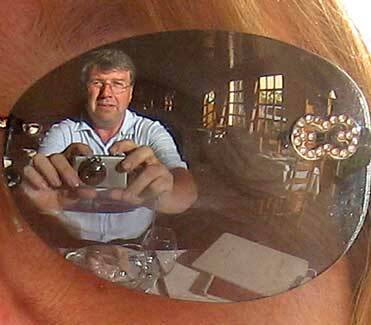 There again Pixie had some new sunglasses she'd bought in Cannes and I was extremely brightly lit; just the cue I needed for a touch of narcissism. Don't worry; I won't be making a habit of it.